Few cities can boast hometown heroes as reliably rowdy as the Dropkick Murphys. Two decades in, the Boston-bred rockers have delivered more Guinness-soaked, Celtic-punk anthems than any band their size on this side of the Atlantic, and on their ninth album, “11 Short Stories of Pain & Glory,” they show no signs of mellowing with age. Instead, “11 Short Stories” finds the band serving up pint after pint of a familiar brew — the heady blend of fist-pumping anthems, traditional Irish instrumentation, and scrappy, blue-collar grit that’s made them a household name — while using their distilled strengths to break fresh ground. In many places, the album caters to expectation. On the surging opener, “The Lonesome Boatman,” the band transforms a classic Irish folk tune into a gale-force wind of mournful whistles and stadium-filling bellows. “First Class Loser” takes merciless aim at those miscreants most frequently found lurking on Lansdowne past 2 a.m. on a Thursday. And “I Had A Hat” is a rip-roaring, broad-grinning singalong best suited to the kind of bar-crawl bacchanalia these Bostonians know firsthand. Yet, for all its lighthearted highs, the album takes the Dropkick Murphys to unusually dark places. “04-15-13” is as good a Boston Strong track as any written previously about the 2013 Marathon bombings, a feat owed to their careful balancing act between thematic simplicity and lyrical specificity. The song is everything “Patriots Day” should have been: a righteous elegy to lives lost, a paean to those hurting and healing, and — with the refrain “We’re all just people trying to make our way” — a full-hearted, all-inclusive hat tip to every hardened yet hopeful local still soldiering on. 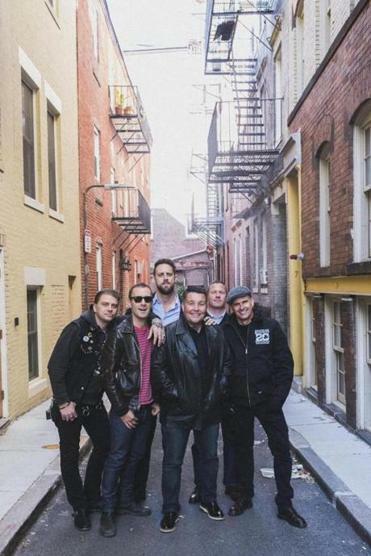 The Dropkick Murphys have also been vocal about their interactions with people impacted by the opioid crisis, particularly those encountered through their charitable Claddagh Fund. “11 Short Stories” reflects such philanthropy; tracks like “Rebels With a Cause” and the cover “You’ll Never Walk Alone” are unmistakably the work of musicians increasingly conscious of their power to reach and reassure struggling fans. “But my hopes are so much higher,” Ken Casey shouts on “Paying My Way,” a potent, forward-facing highlight. “Don’t count me out, I’m a survivor.” There, and elsewhere (most stirringly on the closer, “Until the Next Time”), the Dropkick Murphys aren’t only speaking directly to fans but also on their behalf. It’s a right only Beantown ambassadors of their lofty stature have earned. globe.com. Follow him on Twitter at @i_feldberg.